The Calder Cup Playoffs are underway and collectors can get in on all the excitement of American Hockey League action thanks to the recently-released 2017-18 Upper Deck AHL product. 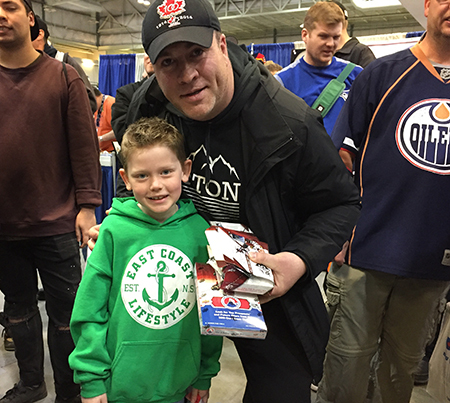 Fans grabbing boxes seem very excited! For over 80 years, the AHL has been a training ground for some the best talent in the game and most NHL® players have played at least one game there. In fact, there were 640 AHL grads found on NHL opening night rosters for the 2017-18 season! 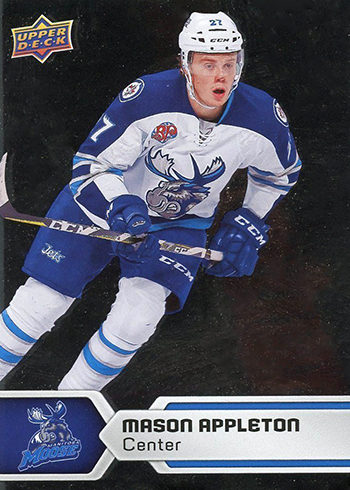 Since the 2013-14 campaign, Upper Deck has been producing an AHL trading card release and bringing collectors cards of their favorite prospects as they develop into stars. 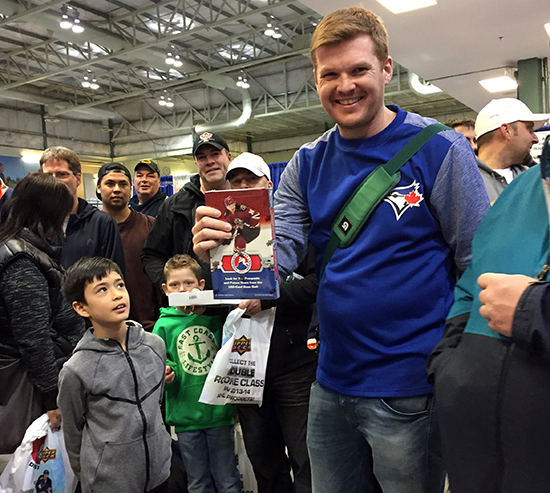 These fan-friendly releases have been loaded up with plenty of autographs and inserts over the past five seasons and this year’s edition carries on that tradition. Starting with a 150-card base set (including 50 short prints), each box is an adventure for fans. The checklist has a mix of fan favorites and hot prospects, with autographs falling three per box on average. New for this season are silver foil parallels along with Team Standouts inserts that spotlight a player from each club. As an added bonus, each box has a Team Logo Poster for fans to enjoy. This product will also release soon on Upper Deck e-Pack. An examination of the 2017-18 Upper Deck AHL checklist shows some of the best young stars in the pipeline for each NHL® team (the St. Louis Blues send players to multiple clubs). 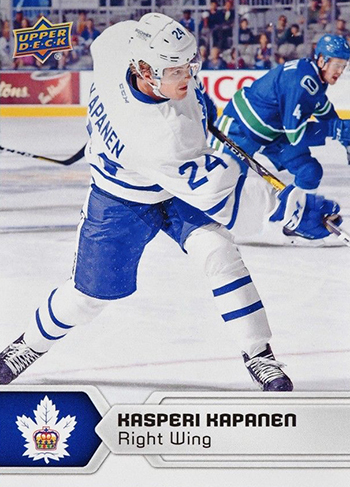 Several of these players have made their NHL® debuts and have rookie cards on the market already, so getting a card of them in their AHL uniform is a rare treat. Some players have debuted after the 2017-18 rookie card deadline and will not have an NHL card until next season, making these cards a nice pickup before those other cards hit the hobby. 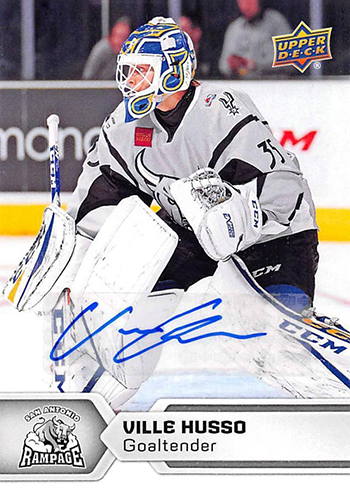 While Husso made his AHL debut in 2016-17, he only appeared in 22 games that year and still qualified for a spot the league’s All-Rookie Team thanks to a great year with the Rampage. Over 37 games, he went 15-13-5 and recorded four shutouts. Called up several times to the St. Louis Blues, his credentials before coming to North America are quite impressive as well. In 2014, he won a gold medal with Finland at the IIHF World Junior Championship In 2015-16, he was the SM-Liiga’s Best Goaltender while playing for HIFK in Helsinki. 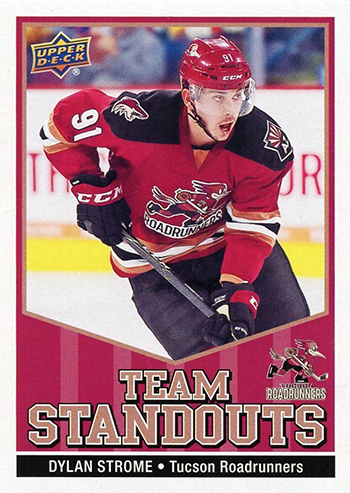 Strome split the 2017-18 campaign between the Roadrunners and the Arizona Coyotes and was the AHL’s top rookie scorer on a points-per-game basis (50 points in 47 contests). Some fans were already familiar with his accomplishments at the junior level and have been picking up his cards. Three of his goals were game-winners and he had a pair of four-point outings against the Bakersfield Condors that certainly helped him earn a spot on the league’s All-Rookie squad. 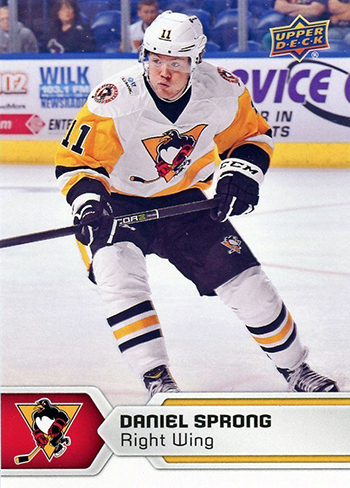 Card collectors are already familiar with Sprong, who is regarded as the top prospect in the Penguins organization. 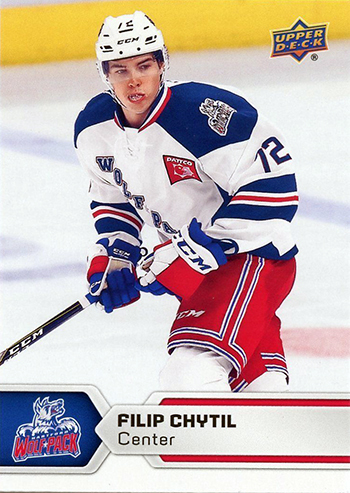 While his rookie cards first hit back in 2015-16 when he had an 18-game trial in Pittsburgh as an 18-year-old, he went back to shine at the major junior level and continued to hone his skills. A member of the AHL’s All-Rookie Team, he was fourth in freshman scoring and has a real nose for the net as evidenced by 30 goals – tops among first-year players. No AHL rookie racked up more assists (42) or points (63) in 2017-18 then Appleton, who was awarded the Dudley “Red” Garrett Memorial Award as the AHL’s top freshman. A sixth round steal by the Winnipeg Jets in the 2015 NHL Entry Draft, he is yet another promising prospect for the club that could make an impact in the coming seasons. On five occasions during the regular schedule, he recorded three points in a game! Turning pro at the age of 18 can be a daunting challenge for any young player, but Chytil made a strong impression at both the AHL and NHL levels in 2017-18. After playing two games for the New York Rangers, who took him 21st overall in the 2017 NHL Entry Draft, he joined the Wolf Pack and his strong play earned some additional stints in the Big Apple. Exciting to watch on the ice, he found time to play for the Czech Republic at the 2018 IIHF World Junior Championship and put up 31 points over 46 games in Hartford. There are even one-of-one printing plate cards randomly inserted into packs! 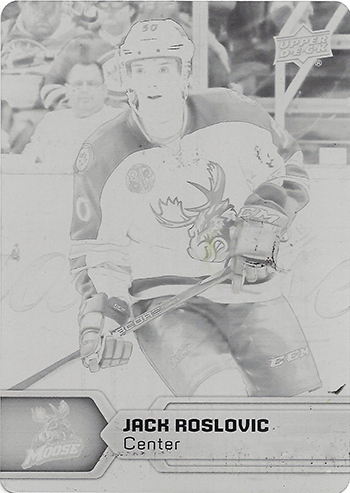 Roslovic split the 2017-18 season fairly evenly between the Moose and the Winnipeg Jets and was able to really shine at the AHL level with 35 points over 32 games. Called up in January, his rookie cards can be found in this season’s products. In early November, he had back-to-back three-point games against Stockton and San Jose. The captain of the gold medal-winning American squad at the 2017 IIHF World Junior Championship, Kunin’s first full pro season has seen him grow as a member of the Wild at both the AHL and NHL levels. In 36 games with Iowa, he scored 10 times and assisted on nine other tallies. 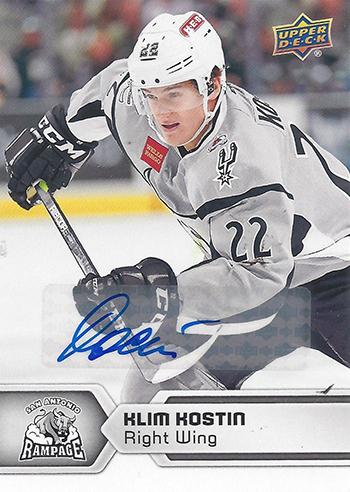 On February 12, 2018, he scored twice and earned an assist in a 3-2 victory over the San Antonio Rampage. 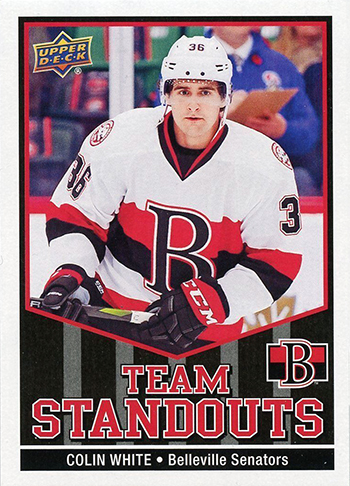 The first-year Belleville Senators saw some strong prospects hit the ice at the Yardmen Arena and White delivered a strong effort in his first full pro season. Hampered by a wrist injury early on, he excels in all situations and his best outing saw him produce a goal and two assists against the Laval Rocket on March 25, 2018. 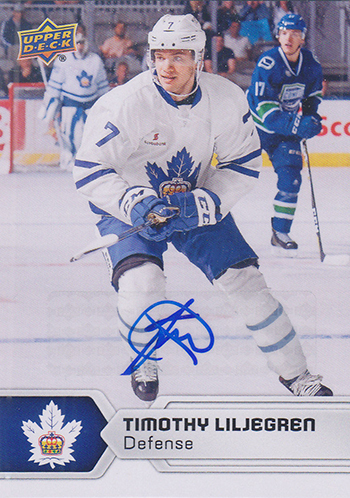 A first round pick by the Maple Leafs in the 2017 NHL Entry Draft, Liljegren almost made the big club to start this season and has looked strong in his first pro campaign. 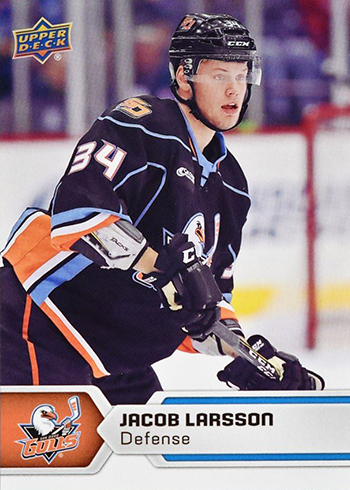 He battled an upper body injury and missed some time to play for Sweden at the 2017 IIHF World Junior Championship, but looked solid with 15 points over 42 AHL contests. 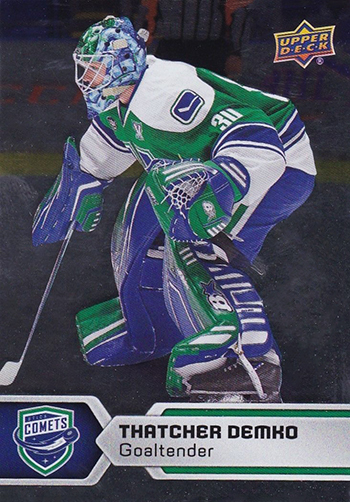 Demko grew up with Upper Deck hockey cards since his father, Brenton, worked for the company. Now, he gets to be on his own as one of the brightest goaltending prospects in the game today. A sophomore pro and former collegiate standout, he hit the 20-win mark for the second straight year and also made his NHL debut with the Vancouver Canucks. 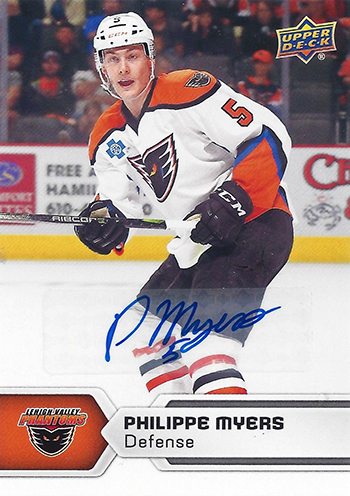 Those that have watched Myers in his rookie AHL campaign are puzzled as to why the big defender was never drafted by an NHL® team. Over his first 50 games, he put up 21 points and should get a shot at a job with the Flyers soon. 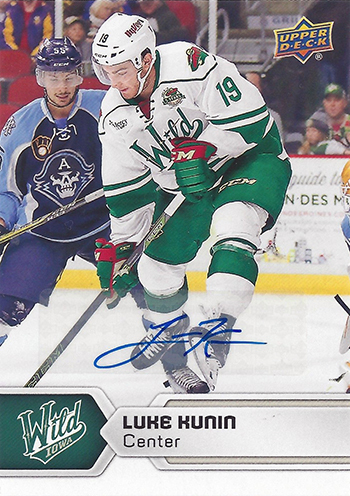 In 2015-16, he led the QMJHL in plus-minus as a rookie and won a league championship with the Rouyn-Noranda Huskies. Larsson won a pair of Champions League titles in Sweden while playing for Frolunda and looks to bring those winning ways over to North America. In his first full AHL season, the smooth skating blueliner put up a respectable 15 points. His biggest goal of the year was an overtime winner against the Ontario Reign on March 2, 2018. A former WHL Rookie of the Year, Merkley made an incredibly smooth transition to the pro ranks by averaging over a point per game (39 points in 38 contests). While he battled injuries as an AHL rookie, he had an impressive four-game goal streak. He also got a one-game promotion to Arizona and his rookie cards could be a solid pickup. Kostin was chosen 31st overall in 2017 and has the potential to develop into a solid power forward. Just 18 years old, he looked great for Russia at the 2018 IIHF World Junior Championship. In San Antonio, he is learning to adjust to the pro game and he scored his first goal for the Rampage back on October 22, 2017 while facing the Texas Stars.